When pipetting large volumes of solution, there are only a few tools on the market that will help speed along the task. 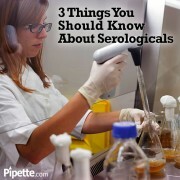 The most popular tool for the job is the serological pipette. These pipettes have several features that makes them perfect for any lab. Pipette.com has composed the top features you should keep in mind when reaching for your serological pipette. “Designed for accurate and rapid fluid dispensing”, serological pipettes are manufactured from sterile medical grade polystyrene. These pipettes are pryogen free and packaged individually to ensure they are sterile, reducing your chances of contamination. Providing seamless transition, each serological pipette is color coated to allow for easy identification. To optimize optical clarity, each pipette has high contrasting black markings. The ascending and descending graduations found on all of the serological pipettes, excluding the 1mL pipette, allows for you to easily measure the correct volume. When working with solutions it is a necessity to know that your tools are measuring both accurately and with precession. Historically serological pipettes have not been considered reliable when measuring for accuracy. This issue has been removed in the present day serological pipette, which are “guaranteed accuracy and precision to +1 – 2%”. To provide proper solutions handling, each serological pipette is manufactured with “an innovative filter plug”. These filters are non-toxic and prevent pipette controllers from becoming damaged due to solutions overflow. When purchasing your serological pipette, you should always look at who you are purchasing from. Distinguishing where you get your supplies from can save you hundreds of dollars. This is no different when purchasing your serological pipettes, a brief examinations in cost can save you big time. Unfortunately, many companies will discriminate against their customers based solely on the size or type of business. This means smaller businesses and universities will be charged more for the same products purchased by a larger corporation. Pipette.com makes it simple by offering the same lower prices and great deals to all of our customers. To help with your pipetting needs, we are currently providing an amazing deal on our serological pipettes. 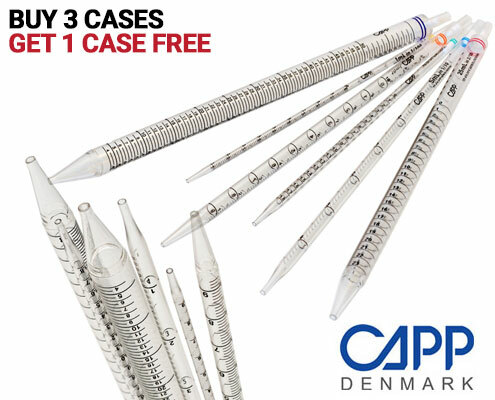 Buy 3 cases of our CAPP serological pipettes and get one free! Mix and match the sizes that best suit your laboratory needs. Use promo code:CAPPSP to take advantage of this great offer. Contact us if you have any questions about serological pipettes or would like assistance purchasing one of our products.